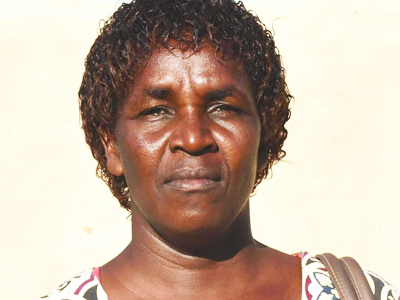 My name is Jennifer Mutinda, I am 47 years old and I come from Kawongo in Kitui County. I joined GROOTS Kenya in 2003 through the Community Responses to HIV/AIDS program. A team of men from my community interacted with GROOTS Kenya in Mathare where the organisation was supporting women living with HIV/AIDS and asked to partner to start up a similar initiative locally. I was among 10 community members selected to attend a workshop with other members of GROOTS Kenya where we were trained on home based caregiving. Before joining GROOTS Kenya, I was only a teacher with very little skills on farming and almost no interest in community activities. I couldn’t even attend a chief’s baraza. I had absolutely no interest in anything except for school and church activities. After joining GROOTS Kenya, my life started anew. The numerous trainings equipped me with knowledge and skills that enabled me interact with people at different levels of leadership which earned me recognition as a leader. GROOTS Kenya encouraged me to pursue a diploma in community development which enabled me to serve my community better. I started participating in various committees such as the Area Advisory Committee to influence positive change in the community. I also got promoted to a senior teacher and later to a deputy head teacher. The exposure enabled me to see the problems affecting my community and how I would play a part in solving them. This is when together with other community leaders we started lobbying for various development projects such as putting up a youth polytechnic to offer skills and knowledge to children affected by HIV/AIDS, construction of a health facility to cater for people affected by HIV/AIDS, improved farming methods to improve nutrition and generate income, and improved delivery of services to the community. 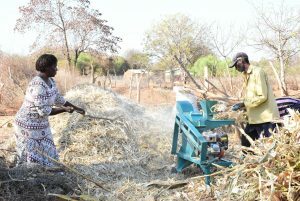 Through peer learning exchanges on agriculture and entrepreneurship I was able to replicate the skills acquired back in my home and in the community. I am now a model farmer in my locality with sixteen dairy cows that I am able to feed throughout the seasons rainy, or not. I have constructed a store where I keep fodder for my cattle which sometimes lasts upto 3 months. I grow the fodder on my farm. Due to the trainings I received I have been able to develop proposals to fund various community initiatives such as purchasing dairy goats and giving support and care to people living with HIV/AIDS. Additionally, hundreds of people have been supported to purchase water tanks, pay school fees and establish small businesses with my intervention. I have helped organize people living with HIV/AIDS to establish various forms of income generating activities which has been very successful. More women in my community have now risen to become leaders and this has helped us rid our community of negative cultural habits. I am currently championing for the adoption of clean cooking technologies among the residents of Kitui while also lobbying the county government to mainstream clean cooking programs in the county policies and plans.